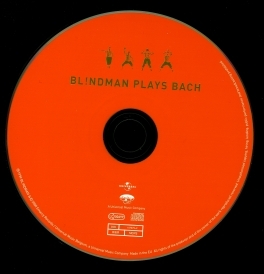 BL!NDMAN records BLD001 / TEMPORARILY SOLD OUT ! In these little-known organ works Eric Sleichim discovered a sparkling inventiveness and deep emotion. What is more, when the four saxophones unravelled the young Bach’s ingenious intertwining of the parts, the result was a disarming transparency. This modest and broadly coloured, essentially religious work assumes a secular dimension of pure enjoyment and goes back to the source of all music: the breath. With the very first variation, the gentle prayer of protection is intoned, interpreted in the text by Alberus “Lord, protect us this night”, addressed to the Christ, associated with the glorious day. The rhetoric uses triplets for the ascension and fall of the angels (Partita VI) and descending sequences for the closing eyes (Partita VII). From the absence of a pedal part, we can deduce that the work was written during Bach’s youth, perhaps while in Lüneburg. The text, included in the psalters at Weimar and Leipzig, is a prayer for a peaceful death. The ascending and descending chromaticism in Partita VIII symbolises the fall and transfiguration by death, while the fanfares in Partita IX represent the resurrection. The authenticity of this choral partita has not been confirmed, but the recent discovery of a chorale with three variations on the same text, by Bach, seems to reinforce the theory behind its inception. Of the four pieces interpreted in this recording, this is the most archaic, allowing us to imagine ourselves in the presence of the original version, dating from the 1700s. The final piece (Partita IX) takes the form of a free fantasia with many changes of “tactus”. The text of this chorale, published in 1663, is linked to the prayer “Salve Jesu” and describes Christ’s Passion. The language and musical rhetoric are similar to those used in the Passion according to St. Matthew and demonstrate full maturity, particularly in the last two Partitas (X and XI). The rhetoric of the Passion and the Resurrection are very clearly brought into play. The chronology of the various Partitas seems to have been reworked dramatically between the initial version and the final version, in 1717. 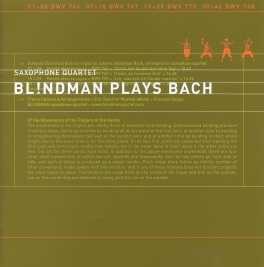 The musical adventure behind this BL!NDMAN recording has been linked to research into articulation especially modified for the saxophone; ultimately, it is an integral part of the creation of a new, unique ‘instrument’, adapted to Bach’s writing – this quartet of saxophones with such a unique sound. The morphology of the saxophone is reminiscent, in more than one respect, of that of the pipes of certain organ stops for which these “Choralpartiten” (choral partitas) are intended: the reeds (oboe, cromorne, bombarde) as well as the flutes (pommer, gedeckt) or the narrow string stops such as the viola da gamba or the Erzähler. Beyond these initial similarities, the differences soon became clear. Firstly, the dynamic style of playing the saxophone which enables modulations in intensity which are impossible on the organ within the same registration and, chiefly, the continuous dynamic movements (crescendo and diminuendo). Then there is the rhythmic and agogic independence of the four parts, played by four different interpreters; as if the ten fingers and two feet of the organist could be perfectly dissociated so as to achieve unrestrained inequality – the ultimate freedom of keyboard players. Then again, there is the modulation of tone within one and the same phrase which, in the most melodic variations, likens the solo instrument to the oboe in the most beautiful of Bach’s arias (BWV 770, II; BWV 768, I). Listen, for example, to the very slow attacks of the accompanying voices, reminiscent of the consort of viols (BWV 770, III). Or the subtle shaping of the soprano paraphrase against the strictness of the cantus firmus, over the perpetual dolcissimo movement of the lower voices (BWV 768, X). The visual image which is then spontaneously presented of this new instrument is that of a protean, multi-dimensional and perfectly ductile keyboard. The decision to present the melody of each cantus firmus on its own is intended to remind us of the individual nature of each of the four instruments, as well as of the antiphonal tradition of the Lutheran rite. These four choral partitas are generally assumed to have been written around 1700, when Bach was only fifteen years old; their perfection would seem to confirm that he was subsequently able to return to and rework them. The choral partita itself is the continuation of a writing style already in use among J.S. Bach’s predecessors and first practised by Georg Böhm (1661-1733). The term partita – which, until Bach, always assumes variation – would, from Bach onwards, also come to mean a suite of individual pieces, even dances. The choral partita is a set of variations in which the harmonic and metrical thematic foundation (cantus firmus) of the original chorale is maintained. In this respect, it can be distinguished from the variation techniques used in liturgical organ music such as the motet, in favour of the simple succession of different ‘variations’ on the same theme. We see here, however, the degree of inventiveness with which Bach handles this ‘poor’ technique, bestowing an individual identity on each of the variations, going so far as to give the impression that each piece, while conforming to a standard, has always been a separate, independent entity.